An intriguing query came into the members’ interests mailbox the other week. Darren Smith collects old theatrical autographs, photographs and other memorabilia, and this one foxed him, so he wrote to us asking if anyone could decipher it. Robson appeared in the role of Jem Bags, a bedraggled Cockney street-singer, in The Wandering Minstrel, a one-act farce by Henry Mayhew, which was first performed on 16 January 1834 at the Royal Fitzroy Theatre, London, but Robson, who at that time was only a boy, wasn’t seen in the part until, I think, 1852, in Dublin, with revivals in many towns and at the Olympic Theatre in the West End until not long before his death in 1864. “How wonderful! Thank you so much for your insights! I am delighted. I wonder if we can put a rough date to it? The photograph shows him apparently in good health and looking rather dapper. The note is written on ‘Royal’ Olympic Theatre paper*. I would hazard c.1857 when he took over management of the theatre from Wigan – at least the photo might be dated. Perhaps the note was hurriedly scribbled some years later. Actors often have flattering photos of themself from some years past, perhaps he had a drawer full of them! There is no address on the note, so who was the ‘fan’? Did he have dozens of photos that he handed out to admirers? I wonder? Now I am very curious to learn something about Victorian actors and their ‘fans’. Was a request for an ‘autograph’ a phenomenon even then? Surely it was rather novel to have photographs of oneself to give out in the 1850s? ‘The Late F. Robson’ is written in a lilac ink in a very fine hand top left – I wonder who the collector was? 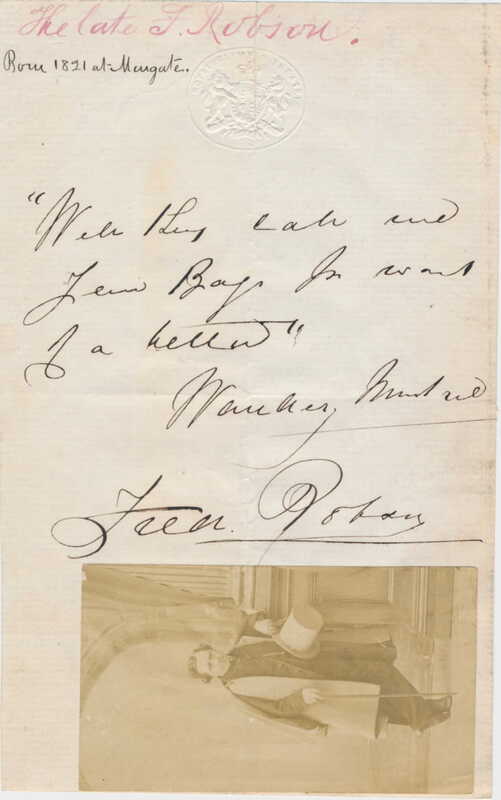 The photograph itself is printed on thin paper that seems to be very well affixed to the letter as if the photo were supplied with an adhesive on the back – rather than glued by Robson. Anyway thank you so much. How fascinating! Our new website gives members an excellent platform to share research and post queries or discoveries. If you are a member and have something to share or ask, go into your Members’ Area and place a notice – after approval by a committee member it will reach the wider public.